Updated: 3:55 p.m. | Posted: 9:07 a.m.
A Minnesota prosecutor said Wednesday she is dropping charges against 17 people who were arrested while protesting the 2016 fatal shooting of a black motorist whose girlfriend livestreamed the shooting's bloody aftermath online. Several of the 17 had been scheduled to go to trial in mid-August, more than two years after protests erupted following the death of Philando Castile. But after six of seven other protesters who went to trial were acquitted, St. Paul City Attorney Lyndsey Olson said, she determined that pursuing the remaining cases wasn't in the city's best interest and the city was unlikely to prevail. Castile, a 32-year-old elementary school cafeteria worker, was shot during a traffic stop on July 6, 2016, after he informed a St. Anthony police officer that he had a gun. Authorities later discovered Castile had a permit for the firearm. The officer was charged with manslaughter but later acquitted. The case got widespread attention after Castile's girlfriend, who was in the car with her young daughter, began livestreaming the shooting's aftermath on Facebook. Thousands of protesters gathered in front of the governor's official residence in the days that followed. 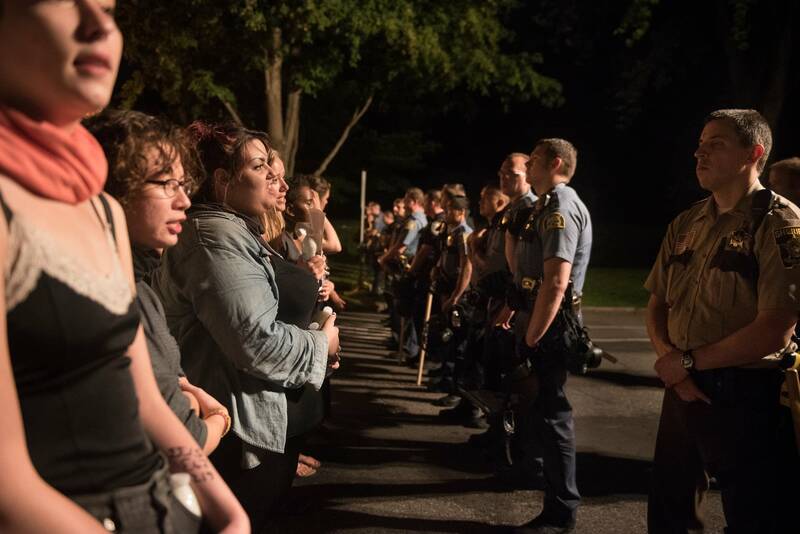 After nearly three weeks, authorities broke up the demonstration, arresting 73 people on unlawful assembly and public nuisance charges. The City Attorney's Office said Wednesday that it still stands by its original position that the evidence supported criminal charges. Most of the people arrested had agreed to guilty pleas. Olson's announcement on Wednesday came just days after Hennepin County Attorney Mike Freeman said he wouldn't charge two Minneapolis officers in the June fatal shooting of a black man who was armed and running from police. Olson's office said her decision was not related to the incidents in Minneapolis. Correction (Aug. 1, 2018): The number of defendants who had charges dropped is 17. The city attorney corrected the number.